The following is the Boxing Insider notebook for the week of January 30th to February 6th; covering the comings and goings in the sport of boxing that you might have missed. 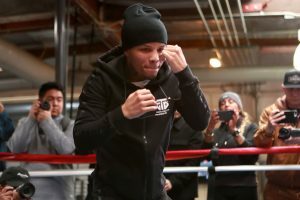 Andrew “El Chango” Cancio (19-4-2, 14 KOs) of Blythe, Calif. hosted a media workout today at Westside Boxing Club in Los Angeles ahead of their 12-round battle. The event will take place on Saturday, Feb. 9, 2019 at Fantasy Springs Resort Casino in Indio, Calif. and will be streamed live on DAZN – which is just $9.99 per month after a one-month free trial. Four fighters from the undercard also participated in the workout. Joseph “JoJo” Diaz Jr. (27-1, 14 KOs) of South El Monte, Calif. will return in a 10-round super featherweight battle against Charles Huerta (20-5, 12 KOs) of Paramount, Calif. Genaro “El Conde” Gamez (8-0, 5 KOs) will battle against Ivan “Striker” Delgado (13-1-2, 6 KOs) in an eight-round lightweight battle between a current Golden Boy prospect and an ex-Golden Boy fighter. The free and interactive Facebook series rings its opening bell next Friday at 2300 Arena in South Philly by showcasing an exceptional, standing-room-only card put together by Raging Babe. Partnering with forward-thinking promoter Michelle Rosado on next week’s “Philly Special” featuring several undefeated prospects – including bantamweight Christian Carto (17-0, 11 KOs) and heavyweight Darmani Rock (13-0, 8 KOs) – FIGHTNIGHT LIVE is sure to get its 2019 schedule off to a hot start. Carto meets veteran southpaw Victor Ruiz (22-10, 15 KOs) in the main event, as the 22-year-old prospect looks to continue to make his case as a contender.Rock will fight in the card’s co-feature, while undefeated Marcel Rivers (6-0, 4 KOs) of North Philadelphia meets Derrick Whitley (4-0-1) of Springfield, Mass. in a special welterweight attraction. Amateur heavyweight standout Sonny Conto of South Philadelphia – a recent signee of monolithic promotion Top Rank – will also be featured in his pro debut as part of a seven-bout card. •Since May 2017, the numbers on the 26-show FIGHTNIGHT LIVE series showed promise and potential for the new platform with an average of 166,508 views per event and more than 4.3 million total views for the franchise. Since Sept. 2018,Season II shows have averaged almost 323,000 views. •The Sept. 2018 “Kings Boxing Tuesday Night Fights” (594,447) from the Sands in Bethlehem, the Dec. 2018 “Queens and Kings of Queens Card” (379,758) in New York, the Nov. 2018 “Hard Hitting Showtime Collaboration” (372,662), the Dec. 2018 “Roy Jones Jr. Texas Throwdown” (318,886), the Oct. 2018 “Hard Hitting Philly Special” (297,545), the Oct. 2018 hour-long Bareknuckle “Freeview” (292,253), the Nov. 2018 “Titans In The Capital” (256,871), the Sept. 2017 “Real Deal Promotions: Empire State” from Resorts World Casino (225,000), and the August 2017 CES “Super Saturday” from Foxwoods (203,000) all logged 200,000 or more views, and collectively the 26-show series has seen a total of more than 4,329,206 views across all devices. •In addition to the raw viewership numbers, the fully-interactive, fan-friendly productions have seen more than 377,000 collective live post engagements (more than 14,500 per show), including more than 293,000 “likes” or “loves,” more than 46,000 comments and almost 16,000 shares. •The Sept. 2018 “Kings Boxing Tuesday Night Fights” from the Sands in Bethlehem set a new bar with 594,447 views and the Sept. 2017 DiBella-CES doubleheader carried the series to three-quarters-of-a-million views in just over four months. The Sept. 2017 DiBella card saw more than 40,000 viewer interactions including almost 39,000 “likes” or “loves” and the March 17, 2018, Murphy’s “St. Patrick’s Day Clash” set a new high-water mark for shares with 2,182. •The FIGHTNIGHT LIVE page on Facebook has more than 86,000 fans and more than 92,000 followers.